Pandanus leaves are woven alongside rattan to create a striking bio-degradable coffin. Our pandanus coffins are a traditional coffin shape or round-ended shape. Pandanus coffins have an interesting two tone effect. Pandanus (wild pineapple) is an alternative to seagrass, when woven it is almost indistinguishable from seagrass. They are certified by The Coffin, Casket and Shroud Association for quality and strength. All coffins have a solid flat base making them suitable for cremation as well as burial. All our eco-coffins are suitable for traditional, green burial or green cremation. 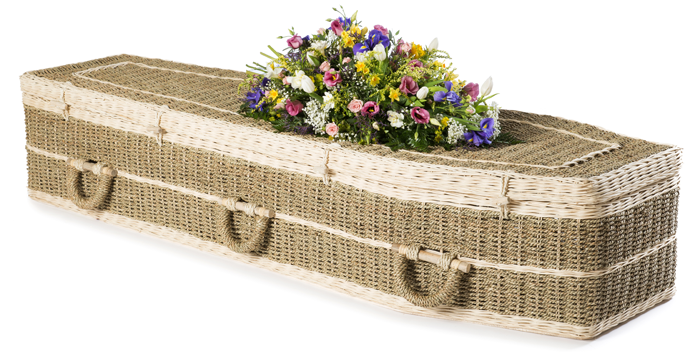 Other natural coffins available are crafted from: bamboo, cane, cardboard, willow/wicker, seagrass, woven banana leaves, and wool. These pandanus coffins are made from sustainable resources; they are 100% natural and biodegradable. They are very strong and tested to bear heavy loads.